These 0 to 10 drill worksheets have been specifically designed to assist young learners in improving their subtraction skills. The worksheets have been segregated in accordance with the number of problems on each page - 15, 25, 50, 75 or 100; that provides for ample practice. Use a stopwatch to gauge a child's accuracy and speed in subtraction. Boost your children's confidence with this collection of 0 to 10 subtraction drills presented in column and horizontal formats. 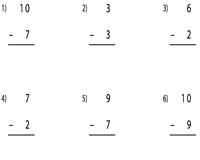 A total of 90 subtraction problems is spread over six worksheets. Assist your children hone their skills in 0 - 10 subtraction with this series of drill worksheets that comprise 25 problems per page. Use a timer to test speed and accuracy in solving these problems. 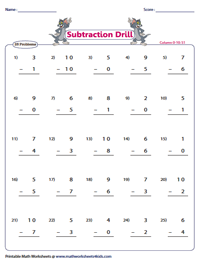 Get your daily fix of subtraction drills with this array of worksheets that have been split in two formats, horizontal and vertical. 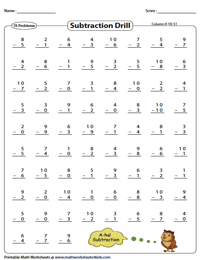 Encourage children to finish the subtraction drills within 8 minutes. This assembly of drills is sure to help young ones reinforce their skills in 0 to 10 subtractions. 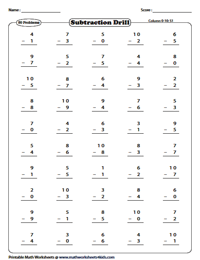 Watch them race against time to solve these worksheets that comprise 75 problems per page! Employ this exhaustive selection of drills to help little ones gain expertise in 0 to 10 subtractions. Use the answer key to help them verify their responses.